This page is a gallery of profiles of warship designs. Click the thumbnail images below to move to the relevant part of the page. DK Browns' 6000 tonne DDH design. An innovative design featuring a split VLS, diesel electric propulsion and a large hangar with two helicopter spots on the roof (served by an internal lift) and one on the stern. Student design by G. Mailer, S. Austin and R. Pawling from the 2001 UCL MSc/ MEng Ship Design Exercise. A 9000te 35knot pentamaran designed to meet requirements roughly similar to those of the RN Future Surface Combatant (FSC) project. The Loch class light frigate, designed by Hall Russel Limited shortly before that firm closed in 1988. This diesel electric powered vessel could be fitted with a wide range of weapon systems. The double-ended Type 43 design is well known. This is the authors' concept of what might have followed - a double ended Type 45. The Rotodyne is a bit of fun. 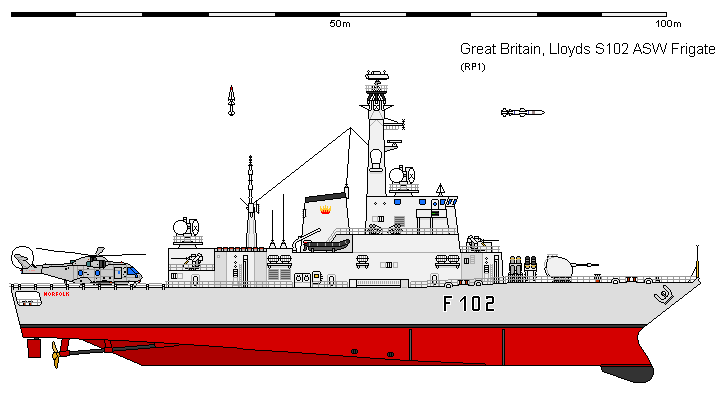 A late Common New Generation Frigate (CNGF) design featuring an alternative mast arrangement. This dates from the 1990s. Student design by L. K. Ong and S. Day from the 2001 UCL MSc/ MEng Ship Design Exercise. A fast pentamaran export corvette. As with most designs intended for export, this vessel could be equipped with several different weapons. This version uses the Barak PDMS and Harpoon ASCMs. A bit of idle speculation from the Author. What would happen if the RN had the same aesthetic as the Soviet Navy? A design proposed by David K Brown for an Advanced Technology frigate with a midships flight deck and double ended propulsion and combat systems. One of a series of designs for mother-daughter combinations studied by BMT DSL and the UCL DRC. 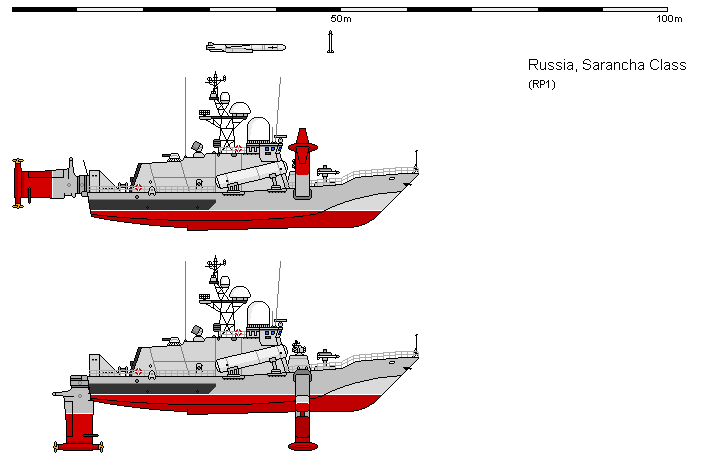 Sarancha / Uragan class missile hydrofoils - only prototypes were built, as the design never entered service. A speculative conversion of the Tiger class cruisers, based on a notional diagram shown in a 1978 issue of RINAs "The Naval Architect". Thornycroft, Giles & Associates (TGA) original S90 "Siruis" design - the "Short Fat Ship". Lloyds modification of the S90 design to meet the equipement and space requirements of the Type 23 frigate. The first trimaran warship design studied at UCL, during the 1990 MSc Ship Design Exercise - a laser and Boxed Ikara armed trimaran frigate. The Akeryards built OPV LE Róisín of the Irish Naval Service. A proposal for an extended performance version of the Pegasus Class PHM. This featured the Hybrid Hydrofoil / HYSWAS concept, where aeroplane configuration lifting foils are attached to a torpedo shaped lower hull increasing the displacement of the craft with less detrimental effects compared to simply using larger foils. A design from French builder CMN for the Combattante IV-NG. This 56m FAC(M) was offered to Qatar, but beaten by the rival VT design. The original drawings were in "Navy International", Sept/Oct 1992. Weapons include a 76mm gun, Exocet SSM, Sadral SAM and Goalkeeper CIWS. Another design offered by CMN at the same time was this 72m semi-planing monohull. The SAM was changed to the Crotale-NG and a helicopter could be carried (but without a hangar). A more radical design from CMN was this proposal for a Surface Effect Ship (SES) corvette, armed with a 76mm gun, Exocet SSM and Sadral SAM. Here, the helicopter was provided with a telescopic hangar. Similar in concept to a hovercraft (but with rigid side walls) this SES would probably have been capable of 40+ knots.